Pres. Soeharto has met Prime Minister Tun Abdul Razak at Penang, Malaysia and returned to Jakarta. Sec. Romulo who attended the ASEAN minister’s conference saw Pres. Soeharto to deliver my letter wherein I pointedly accused Malaysia of training the rebels in the South and furnishing arms, equipment and funds to them. One thing disturbs me and that is that Pres. 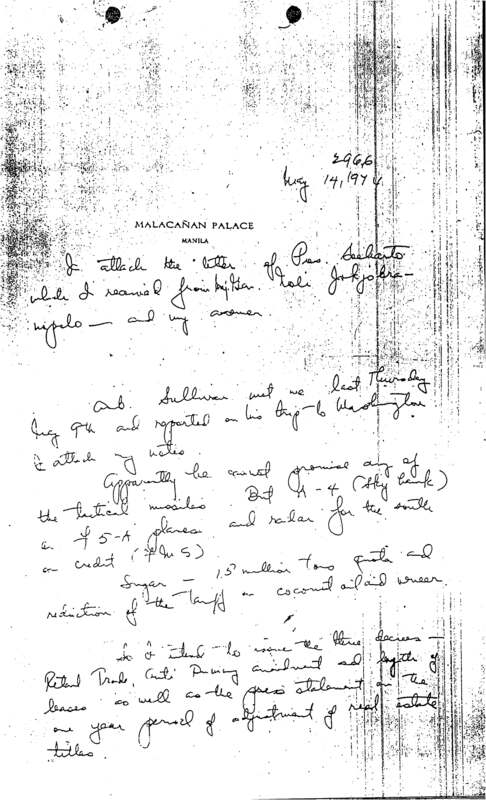 Soeharto seems to be convinced by Razak. 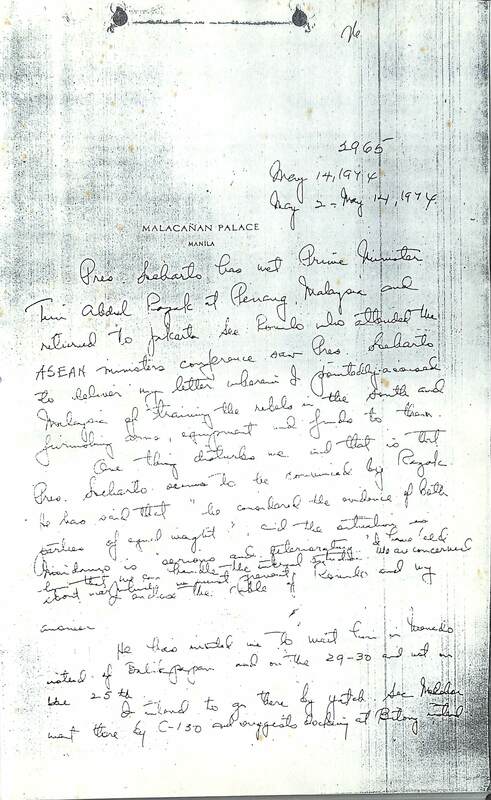 He has said that “he considered the evidence of both parties of equal weight,” and the situation in Mindanao is “serious and deteriorating…” I have told him that we can handle the internal situation. We are concerned about war which we must prevent. I enclose the cable of Romulo and my answer. He has invited me to meet him in Monado instead of Balikpapan and on the 29-30 and not on the 25th. I intend to go there by yacht. Sec. Melchor went there by C-130 and suggests docking at Bitong, instead. I attach the letter of Pres. Soeharto which I received from Maj. Gen. Noli Jokjobranapalo -and my answer. Amb. Sullivan met me last Thursday May 9th and reported on his trip to Washington. I attach my notes. Apparently he cannot prmise any of the tactical missiles. But A-4 (Skyhawk) or F 5-A planes and radar for the south on credit (FMS). Sugar -1.5 million tons quota and reduction of the tariff on coconut oil and veneer. So I intend to issue the three decrees -Retail Trade, Anti-Dummy amendment and length of leases as well as the press statement on the one year period of adjustment of real estate titles. any deliveries on the A-4s???????? ?